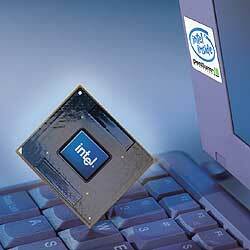 Today, Intel introduced two ultra-low power 500 MHz CPUs, for ultra-mobile computing. Incredibly, when operating in Battery Optimized Performance mode, these units use less than one volt of energy and less than half a watt of power. In this battery saving mode, the processor speed drops to 300 MHz. The really cool feature of this processor is that this CPU can switch both the CPU voltage and its frequency, back and forth, while the processor is running. Intel has figured out how to switch the bus ratios, core operating voltage and core processor speeds, without having to reset the system. Amazing. These are the industry’s first processors to operate at these incredibly low voltage and power values. Using Intel’s SpeedStep technology, these processors can automatically detect if AC power is available and set the appropriate clock frequency and voltage so you can achieve a balance between high performance and long battery life. For further power conservation, Intel's QuickStart technology can power the processor down to the lowest levels, regardless of application, even between keystrokes. With their advanced cooling and packaging technology, high performance notebooks can be in even smaller and lighter packages. Now Ultra-portable PCs can deliver high performance with minimal power consumption yielding extended battery life. Manufacturers can choose between the Ultra Low Voltage mobile Pentium III processor or the value priced Ultra Low Voltage mobile Celeron processors. Pricing for 1000 piece quantities are $208 and $118 each, respectively. These processors are Intel’s response to the low power Transmeta chip announced last year - Read about Sony’s use of the Transmeta chip in their latest notebooks.